Ostrov offers all services from supermarkets and shops, through cinema, theatre, restaurants, bars to indoor and outdoor swimming pools, playground, tennis courts, mini golf, etc. You can also visit the extensive conservation zone. Ostrov gained the city rights in 1331. However, its territory was settled more than 100 years before. 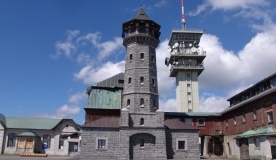 The Ostrov history is connected with the noble House of Slik who founded the silver mines in a nearby town of Jáchymov and minted the dollars there. In addition to the castle, the House of Slik left behind a number of other monuments. The new part of the town was built after the World War II in the spirit of socialist realism. Ostrov lies 17 km to the south of Boží Dar. To travel between the towns, you can use the road and also the green hiking trail. For more information, visit the website of the town of Ostrov.